This ring is sold but I can make you one like it. When ordering, let me know your size and the color purple you prefer (light or dark). The ring is comprised of a polished sterling silver cradle. A beautiful purple amethyst sphere floats freely in the cradle, adding a gentle unique movement to your finger. 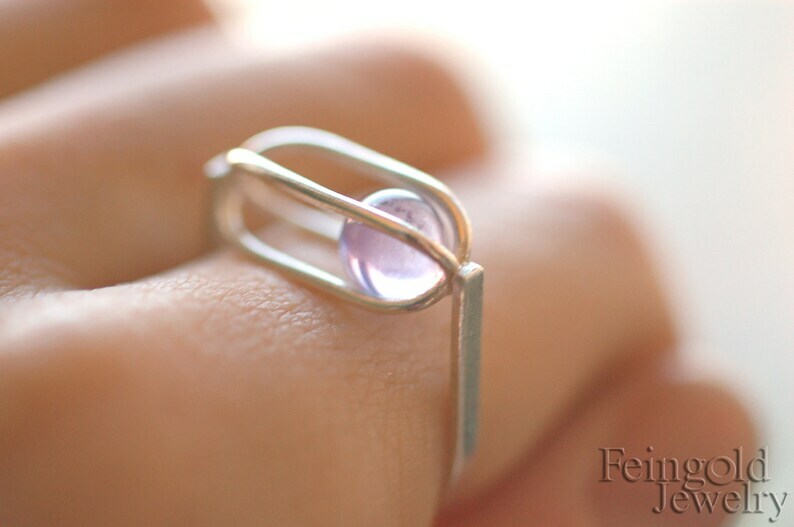 I created this ring through traditional metalsmithing techniques of sawing, forming, hammering, and soldering sturdy sterling silver. I shined the sterling silver ring to contrast the lovely translucent amethyst stone. The ring in the photo is a size 8. It measures 3/4 inch (2 cm) wide and a little under 1 inch (2.4 cm) long.